I was approached by a literary agent who persuaded me to write a book for smokers setting out everything I know so that whenever they try to stop they would have to hand a truly trustworthy source on how best to do it. I was reluctant at first because these books can be very dull! In the end I agreed and have made it very personal, friendly and unswervingly positive â€“ like having a chat with me over a drink or a cup of coffee. Of course it strongly recommends using the free, expert specialist support that is available but it goes further and describes what this should be like and how to get the best from it. My hope is that it will motivate smokers to attend the services and that those who do will want to use the book alongside the support they are getting - to reinforce the messages from the advisor and explain things that there is not the time to explain during the sessions. This presentation will describe the book and provide an opportunity to discuss how stop-smoking advisors might use it with their clients. 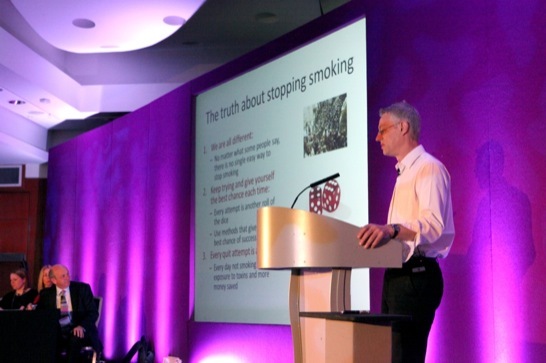 Declaration of interest: I undertake research and consultancy for companies that develop and manufacture smoking cessation products (though not e-cigarettes). My salary is funded by Cancer Research UK. I am a honorary co-director of the NCSCT and trustee of QUIT.